SpatialStories uses what we call ‘Interactive Objects’ shortened hereafter IO (s). IOs are any object you want to add life and interactions to. For instance, you can create a simple cube from within Unity and convert it into an IO or you can import your model in Unity from your favorite 3D software and convert it into an IO. You can also use 2D assets or anything you want. As soon as an object has been converted into an IO, you will be able to interact with it. 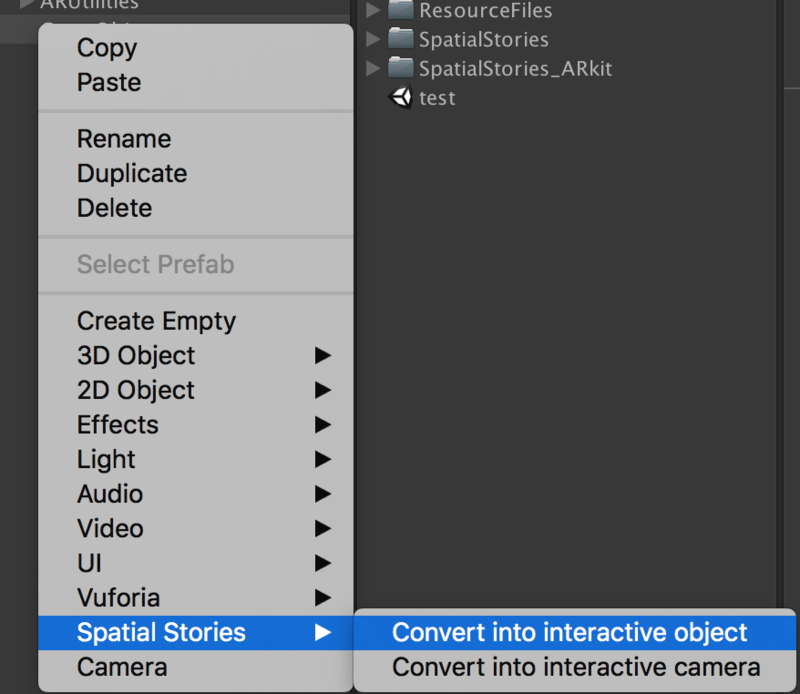 Select your object in the hierarchy or in the scene view and in the menu bar select SpatialStories > Convert > Into Interactive Object. WARNING: Interactive Objects come without a physics collider. If you want to use physics you must add a collider by hand to the visuals of your object. If you don’t want the object to react to gravity, you can uncheck the gravity toggle of the RigidBody.